Impact Coatings in collaboration with ASAHITEC wants to create a better world by delivering technology that can replace the process of wet chemical plating. Within the framework of the surface treatment method PVD (Physical Vapor Deposition), Impact has developed a number of innovative solutions that broaden the applicability of the method. 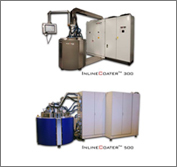 The InlineCoater™ is a fully automatic, production integrated Physical Vapor Deposition (PVD) system that combines the advantages of cluster and batch loaded PVD systems. It enables a wide range of products to be coated with PVD, using the same principles as in the production of semiconductor chips and optical media, and with a universal use of coating materials. 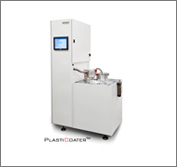 The InlineCoater allows PVD-coatings with better quality than, and at a cost comparable to wet chemical methods. In addition, this system offers productivity up to ten times better than traditional batch loaded PVD systems. The system consists of a base module which handles the goods between four stations, where only one station opens to the atmosphere. In each station, coatings can be performed from above, below or both ways, depending on the choice of method and coating material. The processes work at temperatures below 200oC, in some cases even below 100oC. By running the different stations simultaneously, the efficiency is close to 100%. By optimizing the process at each station the handling time, including loading/unloading, ranges from seconds for thin metallic finishes to minutes for thick ceramic coatings. Its generic design makes the InlineCoater useful for an endless range of applications, such as electrical contacts, decorative coatings, industrial tools, semiconductors/MEMS, EMI shielding, etc. The InlineCoater can be loaded/unloaded using an industrial robot, and with specialized fixtures it can be used to coat many small objects in parallel. The system can also be adapted for use in a cleanroom environment. The PlastiCoater™ in a production cell with molding gives the manufacturer full control of the production flow, reducing lead-time and cost. Better adhesion and fewer defects from metalizing fresh objects without manual interference also significantly improve product yields. Synchronizing molding and metallization has many advantages over separating the processes. Today, objects are usually stored after molding before being manually loaded and metalized in batch-type PVD systems. Often the metallization is outsourced resulting in multiple handling and transport steps. The PlastiCoater is loaded with objects robotically directly out of the injection molding machine. A proprietary system design allows metallization under optimal process conditions at a throughput matching the molding system. Metallization only seconds after molding, while the object is still warm, even allows use of plastics that normally cannot be metalized with good adhesion due to monomers migrating to the surface. The productivity of the molding machine is matched in the PlastiCoater using a load-lock and two process stations working in parallel. The objects are in a constant vacuum during processing and movement between stations inside the system. Only the load-lock opens to the atmosphere. The process stations can be equipped for magnetron sputtering as well as plasma activation and plasma passivation. Two different metals can be coated in the two process stations without contamination or oxidation between the metal layers. The two process stations can also be used for coating the same metal to achieve shorter cycle time for thicker metal films. The system produces a large variety of functional and decorative metal coatings. 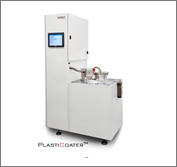 The design of the PlastiCoater ensures good coating coverage of three-dimensional objects. Typical coating materials include Al, Cr, Cu, stainless steel, Ag and Au. 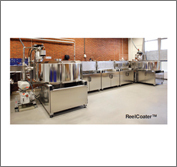 The ReelCoater™ is a Physical Vapor Deposition (PVD) system for volume manufacturing where products, such as electrical contacts, are produced in strip format. Out of all contacts produced for the electronics industry, 2/3 are manufactured in strip format, using reel-to-reel loaded manufacturing equipment. The ReelCoater is designed for such reel-to-reel processing and thereby easily integrates into existing manufacturing lines. The deposition system has a modular design and performs a variety of coating steps in sequence. Multiple reels are loaded in parallel for high productivity and the strips move continuously through the system. Oxide and contamination on the strip surfaces are removed in a clean etching unit before the strips are deposited with wanted materials in the sequential coating units. A ReelCoater can coat 2-4 meter strip per minute and thereby offers cost-efficient productivity compared to wet-chemical plating. The ReelCoater, in combination with Impact Coatings' unique low cost and wear resistant contact material MaxPhase, allows high-volume deposition on a large variety of electrical connectors, at a much lower production cost than using traditional gold electroplating. 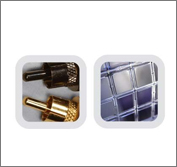 Impact Coatings' unique and proprietary coating materials MaxPhase and Silver MaxPhase are very cost effective replacements for expensive electroplated gold on electrical contacts. They offer superior combinations of low contact resistance and resistance to oxidation, wear, friction and chemical ageing. Moreover, the materials and their coating processes are much friendlier to the environment than gold and electroplating. MaxPhase is a nanostructured ceramic material, providing a unique combination of very high wear resistance and good electrical properties. By alloying various elements, the MaxPhase coating can be custom made and it thereby effectively brings products into line with customer needs. Silver MaxPhase are silver alloy contact coatings that cannot be electroplated. They are decidedly more resistant against different types of corrosion than plated silver, allowing them to be used in low voltage and low contact force applications where expensive gold or palladium plating are the alternatives. Industrial deposition of MaxPhase and Silver MaxPhase is made in Impact Coatings' Physical Vapor Deposition (PVD) systems that allow the contact coatings to be used in very high volume production environments.